Temple of Literature has two main vestiges, there are: Literature worship Confucius and Chu Van An- Quoc Tu Giam career. Temple of literature has one of the most typical architecture style for centuries in Vietnam. Temple of Literature a total of 82 tombstones, with names and origins of 1307 doctors, corresponding to 82 examination courses from 1442 to 1779. Temple of Literature is divided into five court yard, each with its own significance and history. Hanoi Temple of Literature is the first national university in Vietnam with more than 700 years of operation (1076-1802) that has trained thousands of talents for the country. Temple of Literature is one of the first universities in the world. The Temple of Literature ( Van Mieu ), dedicated to Confucius, was founded in 1070 by Emperor Ly Thanh Tong. Hanoi Temple of Literature is the first historical and cultural architecture complex of Hanoi capital as well as Vietnam country. In 1076, the Kinh Ly Nhan Tong allowed to build the Royal college with the purpose as the first university of Vietnam, this architecture was located behind the Temple of Literature, in the first periods this university is just used for the princes, the royals, the gentlemen until 1232 the Temple of Literature has been opened more and selected the locals and persons who learn well to take part in the exams at here. The architecture complex of Hanoi Temple of Literature is situated on the total area around 54331m2. 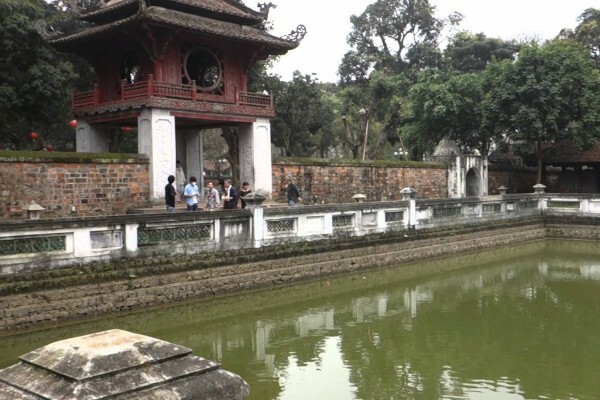 Now a day, in front of Hanoi Temple of Literature still contain a large lake and this lake is called Van Chuong Lake, the old name was still called Thai Ho. This lake looks as a mirror, there are a lot of the different and big trees around the lake so that the tourist will feel very cool and comfortable once walking to this lake in the first time. Hanoi Temple of Literature is located in the center of Hanoi capital, this famous and historical site is mentioned very clearly on Hanoi travel map so that it is very easy for the tourist to find and visit this site from anywhere in Hanoi. Hanoi Temple of Literature is also the proud of Hanoian as well as all Vietnamese, so that you should not miss to visit this famous destination once travel to Hanoi.